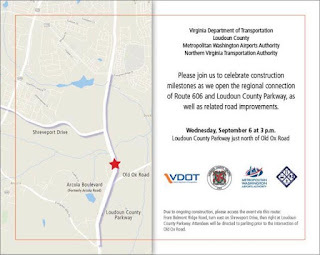 Today, Wednesday, Sept. 6 at 3 p.m., the Virginia Department of Transportation (VDOT), Loudoun County, the Northern Virginia Transportation Authority and the Metropolitan Washington Airports Authority will celebrate several milestones, including opening the Loudoun County Parkway extension and new intersection with Old Ox Road (Route 606), and other improvements. The event will be held at the Loudoun County Parkway just north of Old Ox Road. From Belmont Ridge Road, turn east on Shreveport Drive, then right at Loudoun County Parkway. Attendees will be directed to parking prior the intersection of Old Ox Road. Among the ceremony speakers will be Loudoun County Board Chair Phyllis Randall, and Supervisors Matt Letourneau and Tony Buffington.